As two of the UK’s finest exponents of traditional song, Norma Waterson and Eliza Carthy’s rich, distinctive and authentic voices have engaged new audiences and admirers across two generations. Between them, they have three prestigious Mercury Prize nominations, an MBE each for services to English music and have both been presented with BBC Folk Singer of the Year awards, as well as innumerable other accolades. Eliza recently embarked on her most ambitious project yet by recording and touring with The Wayward Band, a 12-piece adventure. The resulting album, ‘Big Machine,’ garnered both acclaim and chart placings and the big band have quickly become festival favourites. Although they have recorded independently and together on many occasions over the years, ‘Gift’ (2010) was Norma and Eliza’s first duo release, produced by Eliza. The album went on to win Best Album and Best Traditional Track at the BBC Radio 2 Folk Awards. The remarkable new album, ‘Anchor,’ produced by Neill MacColl and Kate St. John, was recorded in their home town of Robin Hood’s Bay and features an eclectic and beguiling collection of both traditional and contemporary songs. Amongst the 11 tracks we find Norma leading on Tom Waits’ ‘Strange Weather’ and ‘The Beast in Me’ by Nick Lowe. Trad Arr. ‘The Elfin Knight’ sees Eliza supported by Norma, Martin and extended family, ‘Lost in the Stars’ is a wonderful take on the Kurt Weill classic, while ‘Shanty of the Whale’, also featuring guest vocals of Martin Carthy, is a track written by KT Tunstall inspired by the singing of the Watersons, now come full circle in mutual respect and admiration. The songs represented on this album all recall influences and cherished friends of the extended Waterson/Carthy family, from New Mexican friends Bayou Seco and the Irish traditional singer Margaret Barry to legendary American ballad singer Helen Schneyer; not to mention the MacColl/Seeger family themselves who are represented in The Elfin Night, a song collected by Ewan and Peggy in the 1950s. The album title ‘Anchor,’ comes from a sailor’s hymn that would have been sung in the Congo chapel itself, even possibly played on the very organ you hear on the recording. It represents being rooted in love and family whatever may occur, which is what this family has always been about. 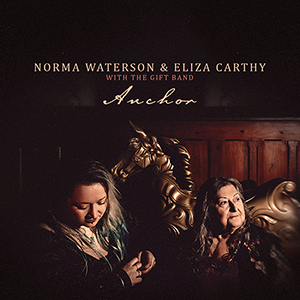 No matter what the origin, Norma Waterson and Eliza Carthy bring songs to life with their great musicality and wonderfully compassionate voices in a way that perhaps only this mother and daughter can. Available now from Topic, Propermusic, Amazon, Spotify, iTunes, HMV and all good music retailers.